Lake Tahoe hiking is one of the area's biggest draws. You don't have to be a seasoned mountain man or woman to enjoy these hikes! Emerald Bay is home to historic Vikingsholm, an authentic reproduction of an 800 A.D. Norse castle built here in 1929. There is a paved trail down, but for parents with strollers, beware, since you'll be pushing it back up the steep hillside. The path is 2 miles round trip and has lovely Tahoe views and benches along the way for resting. Once there, half-hour castle tours are offered all summer, on a varying fee depending on age. Find more information at www.vikingsholm.com. Getting there: From South Lake Tahoe, drive north on Highway 89 for 9 miles, turning right into the well-marked Emerald Bay parking lot. There is a small fee to park, and the trail is easily visible. 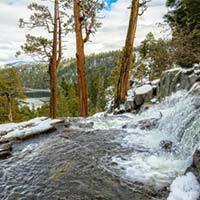 Just across from the Emerald Bay parking lot is the trailhead to Upper and Lower Eagle Falls plus Eagle Lake and the Velma Lakes. The lower falls are visible from the lot, and a 1-mile hike down to the base allows youngsters a chance to see a waterfall up close. There are some stone steps, so strollers are not advised. Those wanting a longer hike can head 1 mile farther to Eagle Lake for a day of water play and picnicking. Getting there: Nine miles up Highway 89 from South Shore or 20 miles south of Tahoe City, the parking lot is on the west side of the highway. There is a parking fee, and you must file a wilderness permit on site, which is free. This choice combines a hike with a chance to investigate a disused lighthouse from years gone by. It's a total loop of 2.5 miles with only a 200-feet gain in elevation, but there are steps carved into the granite, which can be tiring for the very young. The hike offers wonderful views, but there are a couple sections of rock overlook where parents should keep close watch on the children. Getting there: From Tahoe City, drive south on Highway 89 for 15.8 miles before turning left into the D.L. Bliss State Park. Continue 1 mile to the parking lot, and the trailhead is on the left. Out and back to see the lighthouse (rather than the whole loop) is 1.5 miles.